No building lasts forever. Demolition, war and natural disasters will eventually turn every manmade structure into rubble. In case you didn’t know, rubble is a real killer. It’s the world’s largest polluter in volume, it destroys the environment and it’s a health hazard for the people who are forced to live among it. But we think we’ve come up with a sustainable solution to give new function to all this rubble. The Mobile Factory fits into two shipping containers and can be sent anywhere in the world. Rubble goes in at one end, is processed into liquid concrete, and eventually comes out the other side as brand new building blocks. These are designed so that you simply stack them, just like Lego. The new blocks allow victims of war or natural disasters to construct their own n earthquake proof homes. In short, the Mobile Factory helps them rebuild the communities they lost. Urban development, wars, human and natural disasters constantly reduce buildings into mountains of rubble. It destroys capital and kills people, living in badly constructed houses. 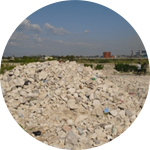 In economical developed countries debris is used as perfect raw material for building constructions. The Mobile Factory transforms debris on location into new, certified building blocks for rapid, safe and affordable housing. Read more about the Q-Brixx in our manual. The stackable Q-Brixx has the same shape as Lego blocks. 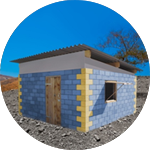 This ensures a highly earthquake resistant construction and eliminates the need for mortar. 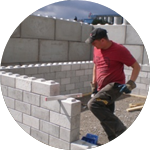 It also makes construction more flexible to build, reduces costs, and cuts down on construction time. 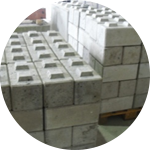 Our Q-Brixx are produced on locations of debris concentration. We train victims of disasters to build their own houses. With your support we will be able to build a saver and healthier world. Especially for the underprivileged. See the manual. Take a look at our crowdfunding campaign – HAITI CALLING – and pay it forward! Hop on board and help to create a happier and saver world by involving your personal network. Here you can find more information about becoming a partner or sponsor!